An advertisement from the 1865 Brooklyn Directory. "Among all the rich and luscious terrestrial fruits which gladden the heart of man and delight his taste and renovate his health," wrote the Eclectic Magazine in April, 1864, "none surpass in variety and value the fruit of the vine. . . . In all ages and in all countries, where the soil and climate admit, the grape . . . has been the favorite fruit, and often the food and drink of man. Among grape growers and vine dressers, Dr. Underhill has become a patriarch and a man of renown. The grapes of Croton Point have long ago become celebrated for their richness and lusciousness, as many tongues can testify which have tasted their sweetness. Dr. Underhill is a benefactor of his age and race, for he puts more pleasant fruits and wine also into the lips of his fellow men than any man we know of. His Croton Point vineyards will be a lasting monument to his fame so long as his grapes grow and flourish. Think of fifty acres of the choicest grapes and of floods of wine made from the juice thereof. Thousands of baskets of rich grapes find their way into the mansions of our citizens and into their mouths also every year, followed, when the grape season is over, by thousands of casks of wine, which in all its varieties and pureness is for sale and can be had at No. 7 Clinton Hall, Astor Place, New-York. 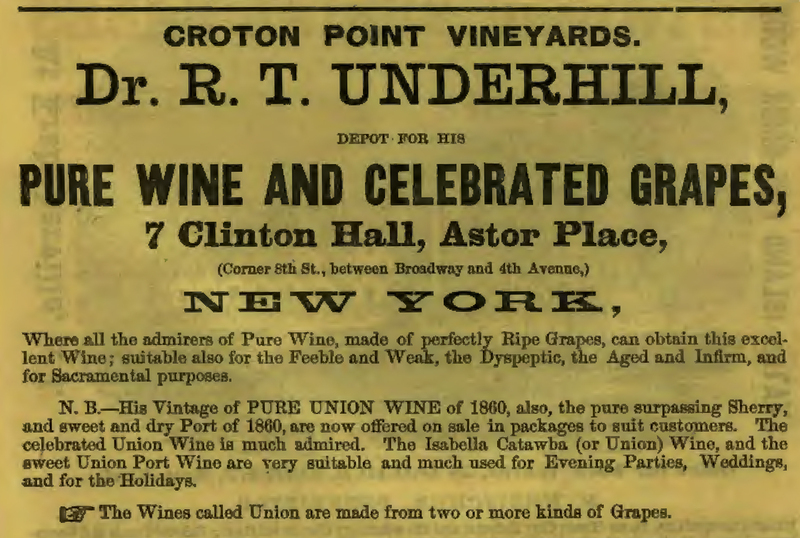 For all medicinal purposes and communion occasions, as well as to renovate impaired health, Dr. Underhill&apos;s varieties of wine is unsurpassed. All this and more also is due to his enterprise and skill in planting and cultivating vineyards so extensive." Previous Post American Cooking, Japanese Service!